What do we understand by Acid Peptic Disorder (APD)? Acid: In this particular case we are talking about hydrochloric acid which is produced in our stomach for digestion of food that we eat. Peptic: Peptic means a substance that promotes or helps digestion. Collectively they constitute disorders of acid production in the stomach which result in digestive abnormalities. Which clinical diseases are included in Acid Peptic Disorder (APD)? Acid peptic disorder represents a common group of disease conditions also known as peptic ulcer disease in which the inner lining (mucosa) of the stomach of duodenum gets damaged or destroyed causing ulcers to appear (similar to wounds resulting from damage to our skin anywhere on our body). What are the causes of Acid Peptic Disorder (APD)? Acid peptic disorder result when damaging agents such as the stomach acids are able to overcome the defence mechanism of the mucosal lining of the stomach and duodenum (first part of our small intestine which connects to the stomach). What are the signs and symptoms of patients suffering from APD? Upper abdominal pain is a classic symptom of patients with Acid Peptic Disorder. The pain has a burning character and occurs either a few hours after a meal or between midnight and 3.00 a.m. However not all patients with these complaints may have a peptic ulcer and vice versa. Peptic ulcer may be present without any abdominal pain. Perforation at ulcer site i.e. a through and through hole develops in the wall of the intestine / stomach causing food and intestinal juices to enter the abdominal cavity. Penetration into surrounding organs. Such as liver, pancreas and large intestine. Narrowing of intestinal lumen at ulcer site causing obstruction to the normal passage of food forwards. What other conditions can be confused with Acid peptic disorder? What are the investigations of choice? It is important to realize that due to lack of precise sign or symptom of Acid peptic disorder, the patient’s history and examination are unreliable tools for establishing the correct diagnosis. Hence the diagnosis of this condition is mainly done by endoscopy and radiography (X-rays). Endoscopy consists of visual inspection of the esophagus (food pipe), stomach and duodenum through a flexible, fibre optic tube passed through the patient’s mouth into the gut. This has the added advantage of obtaining a piece of tissue from the ulcer and surrounding area for examination. Accurate documentation is also possible by recording the procedure on video or colour print outs. Radiography requires x-rays to be taken after the patient ingests a radio opaque contrast medium. It is a cheap and readily available investigation though not as accurate as endoscopy. Decreasing (or completely abolishing) acid production. Drugs which improve the local defence barriers in the stomach. Currently in uncomplicated peptic ulcer disease surgical treatment is infrequently used. Removing the acid producing area of the stomach by removing part of stomach. Dividing the nerve which stimulates acid production or combining it with creation of a separate passage for the bolus of food to by-pass the ulcer area. Simple Laparoscopic closure of the ulcer area, in case it has perforated. Tying the blood vessel supplying the ulcer (in case it is bleeding) or endoscopic coagulation. How long does it take for ulcer to heal after starting medication? The healing rate may differ with different medications; however most ulcers will heal by four to six weeks, though the medication may be continued to prevent recurrence. Can a peptic ulcer recur? Yes, peptic ulcers are known to recur even after adequate treatment. This recurrence differs slightly depending on site of ulcer. 50-60% of ulcers in the stomach reappear after 1-2 yrs. 70-80% of ulcers in the duodenum also reappear. However they may not cause any symptoms to the patient and are detected only on routine endoscopy which is done as a follow up. When is it necessary for a tissue sample to be obtained from the ulcer site? It is now quite a routine practice to take tissue samples for analysis if an ulcer is seen on endoscopy, as it helps in determining the presence of bacterial infection (with H. pylori) known to be one of the causes of peptic ulcer disease. Biopsy is also necessary in (stomach ulcer) as they have a higher chance of becoming cancerous. Is it necessary before starting medical therapy to get investigation done? It has now been commonly accepted that young patients less than 40 yrs of age with short duration of symptoms may be given a course of medicines without confirming the presence of an ulcer. However if their complaints persist despite treatment, then they must undergo the investigations. Elderly patients and those having a long duration of complaints must be investigated prior to starting any medication. Who are more likely to get Acid Peptic Disorder? In young patients an ulcer in the duodenum is seen more commonly whereas in the elderly, ulcers can occur in the stomach or duodenum. Males have a 3 -4 times greater chance of suffering from Acid peptic disorder as compared to females. This is also seen in persons who are anxious / tense or are involved in highly responsible and stressful situation (Pilots/ Surgeons etc.). Is the surgical option considered in these patients? Surgery is considered in case medical therapy fails to control disease progression or in case a complication due to peptic ulcer occurs such as perforation at ulcer site, bleeding from ulcer and obstruction. What is the incidence of recurrence following surgery? The ulcer is known to recur in 1-10 % of patients even after surgery. What is GERD or Gastro Esophageal Reflux Disease? Normally after food passes through the food pipe (esophagus) into the stomach, a muscular valve called the LES (Lower Esophageal Sphincter) closes, preventing the food or acid from moving backward into the foodpipe. The reflux occurs when the LES is weak or relaxes too frequently, allowing acid from the stomach to flow backward into food pipe. The LES can also fail due to a condition called hiatus hernia in some people. Hiatus hernia is an opening in a flat muscle called Diaphragm that separates the lungs from the abdomen. A hiatus hernia allows a portion of the stomach to protrude into the chest causing ineffective opening and closing of LES resulting in reflux. Why should GERD be treated? Although most cases of gastroesophageal reflux are caused by a weakened valve, there might be other causes that should be assessed by your doctor. If left untreated, gastroesophageal reflux can cause esophageal ulcers, bleeding or inflammation; chronic hoarseness, Barrett’s esophagus, and narrowing of the esophagus (peptic stricture) that can cause difficulty in swallowing. GERD can also cause cancer, if left untreated for a long time. Some or all of these symptoms may occur several times a day, particularly at night, and may become chronic. Upper GI endoscopy: It will show reflux and presence or absence of esophagitis. Barium swallow: It will show presence of reflux and associated hiatus hernia if present. Manometry: Will document oesophageal pressures. Not all the tests are always required. Medicines will give relief to symptoms till the time they are taken regularly. Few patients may also get long term relief but may recur again. Moreover, many medicines have side effects. For patients with persistent symptoms requiring chronic medication, surgery is an option, which is also a curative mode of treatment. Surgery can repair the valve (LES) as well as repair the hiatus hernia if present. How is Laparoscopic surgery for GERD different from open surgery? 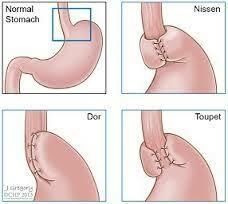 Traditional open surgery for GERD requires a large 10-12 cm muscle cutting incision. Whereas Laparoscopic surgery requires three to four tiny incisions of 5-10mm to perform the same procedure. In other words, more than 2/3 of incision length is saved by laparoscopic approach. Laparoscopic surgery has became a preferred method across the world to treat refractory G.E.R.D (gastro esophageal reflux disease), Hiatus Hernia and Achalasia cardia. With the introduction of manometric and 24 hrs Ph study, the indication for surgery and results of surgery are clearly defined and demonstrated. Laparoscopic surgery called Nissen’s Fundoplication offers a long term relief and an improvement in the quality of life for GERD patients and avoids life long medications. In Barrett’s oesophagus, it offers definite benefits and controls symptoms. Reflux disease associated with Hiatus hernia can easily be done laparoscopically. Now even large hiatus hernias with half the stomach in the thorax can be repaired laparoscopically with minimal pain and quick recovery. 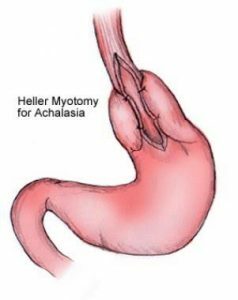 For Achalasia cardia , out of the various treatment options available such as pneumatic dilatation, botulinom toxin injection and surgical cardiomyotomy (Hellar’s operation); randomized trials and meta analyses have proved beyond doubt that surgical myotomy offers permanent relief. Laparoscopically performed surgical myotomy (Hellar’s operation) is a preferred modality of treatment for obvious reasons. In complicated or recurrent cases this procedure can even be done by using an instrument called thoracoscope. We usually combine it with the anterior wrap to prevent gastroesophageal reflux due to disturbed lower esophageal sphincter mechanism. How successful is the laparoscopic surgery? Worldwide experience has shown that over 90% of patients are symptom free after laparoscopic surgical procedure for gastroesophageal reflux disease. The most dramatic change that occurs is the improvement of the quality of life. However its important to go to a experienced surgeon so that the experience of such centers will help you have a hassle free experience. What can a patient expect following laparoscopic surgery? After laparoscopic surgery patients can expect mild pain in their abdomen at the site of small incisions, which usually eases off in 24 to 48 hours. They will also have a feeling of difficulty in swallowing (due to a newly constructed sphincter) which goes away by 4 weeks. Patients are put on liquid diet immediately after surgery and are discharged the next morning on a soft diet.